Abstract: Objective To study the effects of the downregulation of OTX2 on proliferation, differentiation, and autophagy in MC3T3-E1 cells. Methods Small interfering RNA (siRNA) targeting the OTX2 gene was transfected into MC3T3-E1 cells. Cell proliferation was determined by the MTT assay. Flow cytometry was used to detect the cell cycle phase and apoptosis. The activity of alkaline phosphatase (ALP) was determined by a colorimetric assay. Cell autophagy was observed by monodansylcadaverine (MDC) staining. 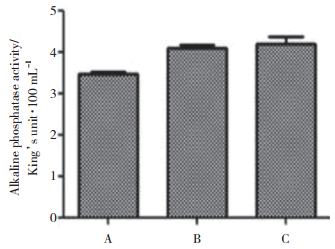 Results The inhibition rate of the experimental group was significantly higher than the control group (P < 0.05). 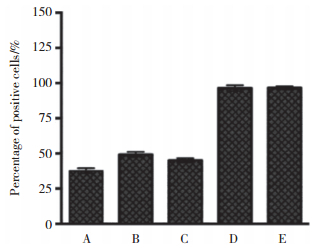 The percentage of cells in S phase in the experimental group decreased after transfection, and the ratio of cells in S phase and the cell proliferation index were less than that of the control group (P < 0.05);the cell apoptosis results showed that there was no significant difference between the experimental and the control groups (P>0.05). The ALP activity in the experimental group was lower than that observed in the control group (P < 0.05). MDC fluorescence staining showed that the staining intensity in the experimental group was weak with little point structure, while the control group showed higher staining intensity. Conclusion The downregulation of the OTX2 gene can inhibit proliferation and reduce the levels of differentiation and autophagy in MC3T3-E1 cells. P < 0.05，compared with negative control group. 1）P < 0.05 vs negative group and control group.